So from Lightroom, As usual I'll right click on an image to edit in PS (be it a copy w/ LR adjustments, straight up or as a Smart Object). I get this pop up (see attached)...yet it's running in the background, I.E. if I minimize LR, PS is in fact open and running normally...usually PS opens up in front after launch. Order of appearance isn't important, it's the message I keep getting, Yes I've reinstalled. This is on a PC...Win 7 Pro, 64bit 128gb ram, 16gb video ram. 900+GB free disk space. Everything is up to date, drivers etc. Just a guess, but maybe two instances of PS can’t run? 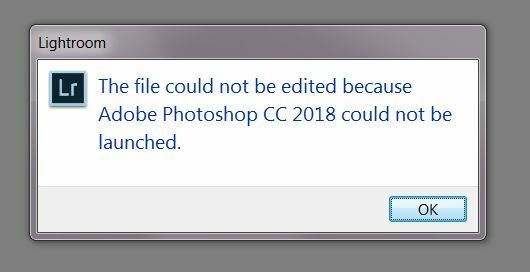 Did you try shutting down PS and then repeating the LR export? Doug, I'd suggest completely shutting down the PC and start it again. There could be an instance of PS running. If so, a complete re-boot should stop that instance. Thanks JR, no...not two running, checked in task manager and only thing running was LR and one instance of PS, Even from a cold restart I still get it. Just started happening recently so I'm wondering if it's just another thing with the newest upgrades, I see there is quite a list going around. Why ask here? Just call adobe. I am sure they can figure it out in an instant. In an instant huh, I guess you never dealt with Adobe....If you ever have, you'd know why I ask here first. Plus I don't have the time to be put in Q for umpteen minutes... yes as a last resort and if it drives me nuts, then I 'll call Adobe. Hope that answered your question. Maybe your settings in Preferences are to blame? Try the settings in each: LR and PS.